Would you like to rapidly improve in every area you choose in life? One of the best ways to accomplish things in life is when you find a master. A person who knows how to get to where you want to be. That's why I created this report to show you how to find great mentors and how to connect with them or build a relationship with them. If you always get the same results, but somehow expect a different outcome is the path to insanity. You do not have to be alone, there will always be a person who can help you in accomplishing what you want out of life. Finding a mentor these days brings an unfair advantage in life. Learn exactly how to do it and go for it. Grab your copy now! Acquista How To Improve Your Business And Personal Life Faster Than Anything Else? 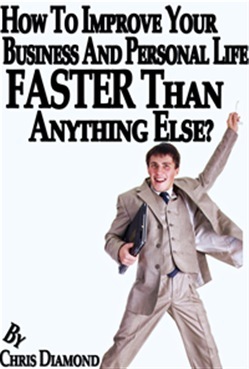 in Epub: dopo aver letto l’ebook How To Improve Your Business And Personal Life Faster Than Anything Else? di Chris Diamond ti invitiamo a lasciarci una Recensione qui sotto: sarà utile agli utenti che non abbiano ancora letto questo libro e che vogliano avere delle opinioni altrui. L’opinione su di un libro è molto soggettiva e per questo leggere eventuali recensioni negative non ci dovrà frenare dall’acquisto, anzi dovrà spingerci ad acquistare il libro in fretta per poter dire la nostra ed eventualmente smentire quanto commentato da altri, contribuendo ad arricchire più possibile i commenti e dare sempre più spunti di confronto al pubblico online.